Frames For Her Baby Blues! 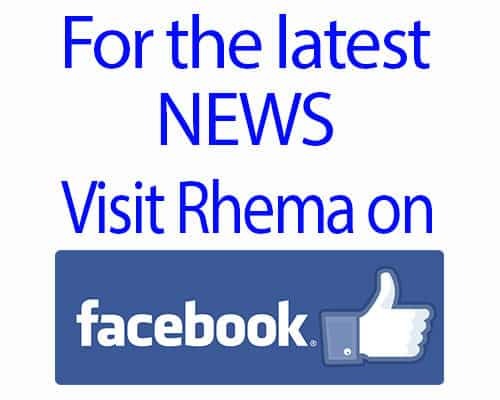 I was not ready for this….. Rhema has to have glasses. So, we’ve noticed Rhema’s eyes doing some funny movements and needed to get her checked out. Our local options had to be explored first so we went to a clinic that was offered through CRS. The physician travels down from New York once a quarter so we were excited to get on his schedule. I asked as may questions as I could ahead of time, but not too much information was offered. Rhema’s OT even wrote and mailed a letter to the clinic folks explaining what she had observed Rhema’s eyes doing. We arrived and verbally explained it to the doc and she told the nurse to dilate Rhema’s eyes so they could check her to see if she needed glasses. I was so shocked as we were not even told they would try this intense procedure. It took three of us to hold Rhema to get the drops into her eyes. I quickly got on the phone to Rhema’s daddy and explained what they wanted to do and asked could he come as reinforcements. The clinic folks were not very kid friendly, much less did they appear accustomed to dealing with kids who have sensory issues and cognitive delays. Rhema and I were put in a room and I immediately began “playing” with the equipment with Rhema to begin acclimating her to all the foreign objects. I held up the light they look in the eye with and “checked” my eyes, I got the small paddle that blocks one eye and termed it a “Pirate patch”, and then we played with the chair she sat in, pushing the button to go up a down. Rhema was really tentative looking and not too convinced with my “act”. Praise God, daddy arrived about a minute before the examining doctor entered the room. The doctor explained that he would hold up different lenses to her eyes and shine his bright light into her eye. So, we had daddy sit in the chair and hold Rhema on his lap and I sat in front of her to help hold her hands and head still. I was just praying peace over her the entire time and praying also that we would not need more folks to hold her down. Ya’ll, Rhema did AMAZING! She sat there like a champ and let the doctor hold up these little circle lenses up to her eyes and then shine this bright light into her eyes. I did not even have to hold her arms tightly; she just totally cooperated! She even let him get really close (like centimeters) from her eyes with the light and she held still so well! I was totally AMAZED at how well she did. When he finished with the exam he said that she has a astigmatism in both eyes and the eye nearest to her current VP shunt is the worst side. She would need glasses for up-close work like school and reading. We asked him about the reason why we came and he said that he was not told about it. Huh? We asked him could he check that, but he said that with the eyes dilated that he could not check for it! WHAT!!! That was the whole reason we came, not for all this other stuff!!! So, we walked out of there needed glasses but still no answers as to why her eyes are doing these strange movements. They want us to come back in two month and they will check her eyes for the reason we went. I’m not sure what to do. Go back there? Find another place? Ugh! Still not sure, even now, what we will do. So, momma and Rhema embarked on a long day of glasses shopping. We went to three places and by the time we were done I was exhausted and pretty upset. For some reason all this really upset me and I was dealing with a lot of inner turmoil. So, I decided that we would make no decision that day but rather would pick up again the next day. I made a quick call to a friend who prayed with me and my sweet hubby took us out for dinner to allow me to talk. I’m still not sure why all this upset me so, but sometimes on this Journey you just feel like you get sucker punched out of no where. This was one of those days. 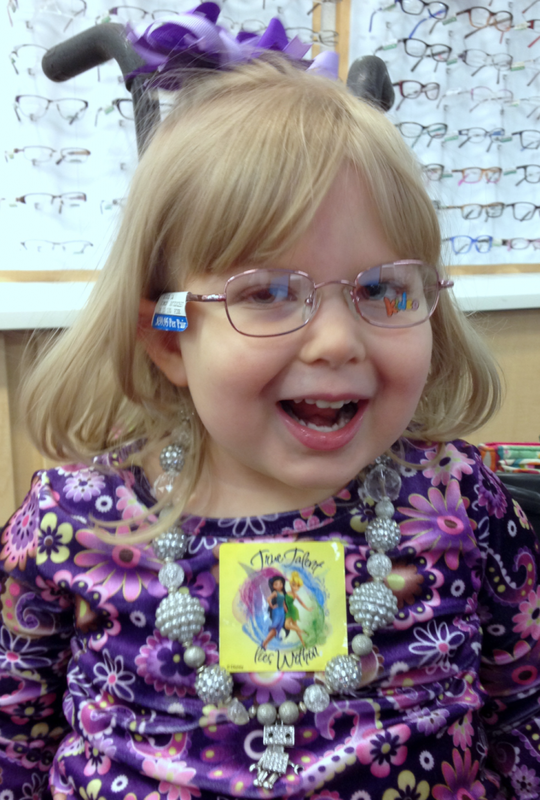 On the bright side here are some pictures from our day while trying on all these teeny, tiny glasses…. These are ones Rhema wanted….. LOL! 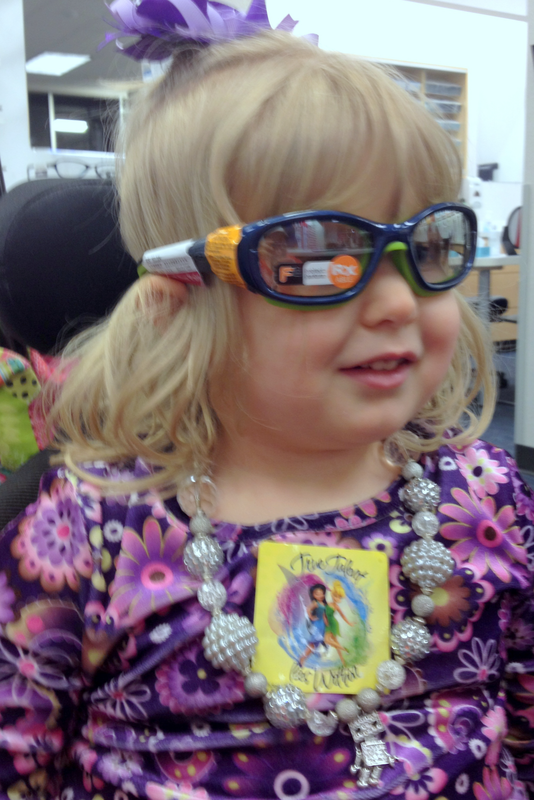 Rhema loves “goggles” and wanted to go swimming immediately when she put these on. Then the lady told her they were for boys who play football, thinking this would deter Rhema, and then Rhema got even more excited about playing football! She is a football girl; she began telling me she needed a helmet, and a shirt and these glasses. The lady was so shocked at Rhema’s excitement over football and we all got a good laugh out of Rhema’s enthusiasm. After much searching we decided to go with the glasses below. We get two pairs for the price of one and they have a year’s warranty. They have these curly, long, plastic pieces that hold the glasses behind her ears and we think they will stay put better. Rhema’s VP Shunt tubing runs VERY close to the skin behind her left ear (and down into her peritoneal cavity) so I’m hoping this flexible plastic on the glass’s arms will not hurt the shunt tubing. Rhema will have one pink and one blue pair of these glasses. She loves wearing sun glasses so I’m hoping she will transition to wearing regular glasses easily. We will get them next week and she will begin wearing them at school and home when we do school work or other up-close activities.